Today, we are living in exceptional times of transformation and innovation, to say the least. This is most likely the most special times in the history of humanity , especially in a few sectors such as the energy sector. Gradually, we are seriously considering our impact on the environment and witnessing the discovery of new technologies such as renewable energies and their rising like never-before all around the world. Although most industries are still reliant on fossil fuels, more and more governments, corporations and civil societies are turning into renewable energies. We are literally witnessing an energy revolution at this time, after the industrial revolution and its heavy weight for the environment, here comes the green revolution. The latest report of the research institute Bloomberg New Energy Finance (BNEF), shows that wind energy is now ahead of all other renewables , with 54% of the RE market. However, It also shows that the highest growth rate registered is within the solar power industry. 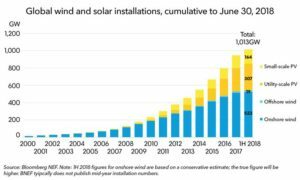 So despite the fact that wind energy is the most advanced at the moment, solar energy is the fastest growing industry. 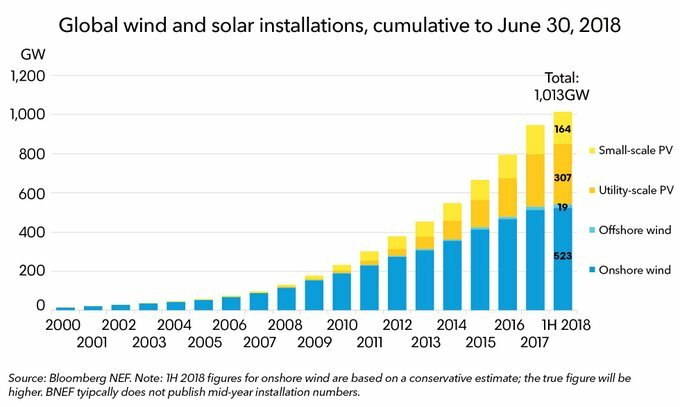 In fact, since 2017, the capacity of solar production has increased of 46% while wind has only registered 8% of growth. The energy industry is a 6 Trillion dollar industry that is being disrupted and transformed by the rise of renewable energy. Despite the high volume of investments into the energy sector, we still count 1,3 billion people on Earth that don’t have access to energy in 2018. Energy is not about individual lives only; It is about development, therefore It is very important for growth of entire economies . There is a moral component to energy , because the way that we have been producing energy worldwide has been widely toxic so far, and we are now feeling the environmental consequences of using sources of energy that produce huge amounts of pollution. In fact, The American Association for the Advancement of Science (AAAS) has declared that about 5,5 % million people are killed by air pollution every year. This is a growing rate every year, urging governments to change the way they view energy and to include the moral environmental and human aspect into the equation. According to the BNEF, since the year 2000, the cumulated capacity of production of solar energy has been multiplied by 65 . They count 54% of production made by wind energy industry and 46% for solar energy industry. According the research center, the global capacity of production of solar and wind energy has reached 1 Terrawatts, that is one thousands billions of watts. This expansion has required approximately $2.3 trillion of capital expenditure. According to the International Energy Agency (IEA), the world’s renewable energy capacity is set to rise exponentially over the next five years. By 2020 this capacity is set to grow by 45%, lead by countries like China and India. India is expected to surpass the entire european renewable energy production capacity in the same period . A capacity of additional 920 GW is expected to be added by 2022 and 740 GW in solar energy alone. In addition, Renewable Energies make the two thirds of the newly added production capacity worldwide.